Boy, do I have some exciting news today! You guys have already been keeping up with my deep learning series. Hopefully, you’ve noticed that I’ve been releasing non-deep learning machine learning courses as well, in parallel (and they often tie into the deep learning series quite nicely). Well today, I am announcing the start of a BRAND NEW series on Bayesian machine learning. Bayesian methods require an entirely new way of thinking – a paradigm shift. But don’t worry, it’s not just all theory. In fact, the first course I’m releasing in the series is VERY practical – it’s on A/B testing. Every online advertiser, e-commerce store, marketing team, etc etc etc. does A/B testing. 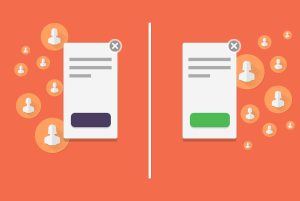 But did you know that traditional A/B testing is both horribly confusing and inefficient? Did you know that there are cool, new adaptive methods inspired by reinforcement learning that improve on those old crusty tests? Well, Bayesian methods not only represent a state-of-the-art solution to many A/B testing challenges, they are also surprisingly theoretically simpler! You’ll end the course by doing your own simulation – comparing and contrasting the various adaptive A/B testing algorithms (including the final Bayesian method). This is VERY practical stuff and any digital media, newsfeed, or advertising startup will be EXTREMELY IMPRESSED if you know this stuff. This WILL advance your career, and any company would be lucky to have someone that knows this stuff on their team. Awesome coincidence #1: As I mentioned above, a lot of these techniques cross-over with reinforcement learning, so if you are itching for a preview of my upcoming deep reinforcement learning course, this will be very interesting for you. Awesome coincidence #2: Bayesian learning also crosses over with deep learning, one example being the variational autoencoder, which I may incorporate into a more advanced deep learning course in the future. They heavily rely on concepts from both Bayesian learning AND deep learning, and are very powerful state-of-the-art algorithms. Due to all the black Friday madness going on, I am going to do a ONE-TIME ONLY $10 special for this course. With my coupons, the price will remain at $10, even if Udemy’s site-wide sale price goes up (which it will). LAST THING: Udemy is currently having an awesome Black Friday sale. $10 for ANY course starting Nov 15, but the price goes up by $1 every 2 days, so you need to ACT FAST.